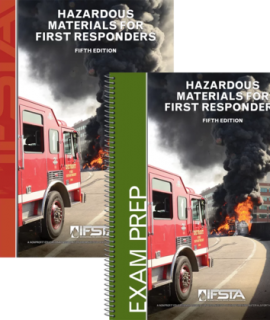 Home / Hazardous Materials / Texts/Handbooks & Supplements / Hazardous Materials for First Responders Manual & Workbook, 5th Ed. Set includes both the manual & course workbook. Prepare to respond to hazardous materials and weapons of mass destruction (WMD) incidents. 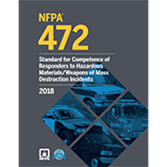 The 5th edition provides first responders with information to take appropriate initial actions at WMD incidents and hazardous materials spills or releases. The focus is detailed information about hazardous materials initial operations. 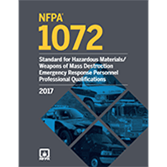 Based on NFPA 1072, Standard for Hazardous Materials/Weapons of Mass Destruction Emergency Response Personnel Professional Qualifications, 2017 Ed. 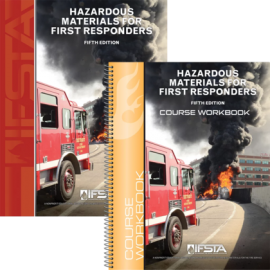 The course workbook is intended as a study aid for students using Hazardous Materials for First Responders, 5th edition. The use of this workbook will help improve student performances. Instructors may choose to integrate these workbook activities into their classes or use them as homework assignments or pre-course work. Different types of questions and activities are used to reinforce different learning styles. References to page numbers are included in the workbook so students can use the product as a self-study tool by referring to the manual for correct answers. The answer key, however, is included with the instructor’s curriculum materials where students cannot obtain access. Hazardous Materials for First Responders Manual & Exam Prep, 5th Ed. 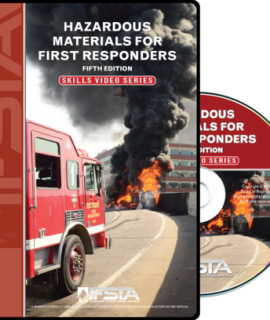 Hazardous Materials for First Responders Skills DVD, 5th Ed.